As you probably already know, Children in Need is on Friday the 17th of November. All through the week beginning Monday the 13th of November, our Student Voice team are organising a range of activities to raise money for this nationwide event. From Monday we are running a “Find Pudsey” treasure hunt. 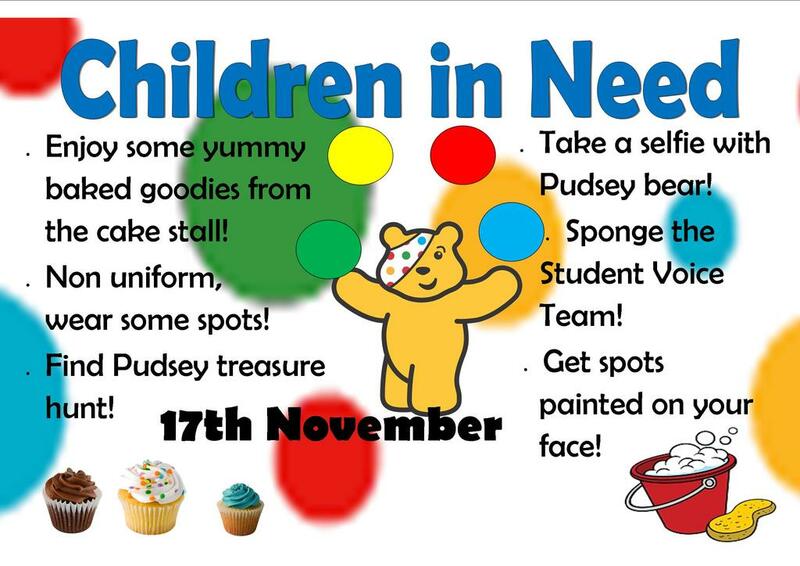 There will be prizes for the most Pudseys found and the tutor group with the most entries. Entries just cost 20p. We will have our very own Pudsey bear that students will be able to take selfies with for a donation from Wednesday to Friday – if there is a demand he might visit on Tuesday as well! There will be cake sales on Thursday and Friday outside T2 (please donate cakes if you can). On Friday 17th students can sponge the student voice team (Y10 area), get face painted spots for 10p a spot (outside T2) and of course a non-uniform day on Friday 17th – wear something spotty! The non-uniform will be one pound as usual. Students can pay their pound from Monday 13th. If you don’t have anything spotty don’t panic, pay for some spots on your face or cut out spots from coloured paper and safety pin them to an old top or pair of trousers! Can we please ask for you to give your children some extra pennies in the week so that we can raise as much money as possible for this really good cause, and so that they can have as much fun as possible throughout the week! If you send money to Children in Need via our Academy, every penny goes to Children in Need. If you make donations via text, you might waste some of that money to your phone provider! Please support our activities, every penny raised will go to Children in Need. All activities will be taking place during break and lunch time. There will be no disruption to lessons. Thank you in advance for your help and support.